… and this food quest because I got excited enough about this resto to tell you, dear reader, about it. Wee! UPDATE 11/08/2017: Chives Bistro has moved to Veniz Hotel in Session. The mouthwatering photos of what they have to offer on their Facebook page made it difficult for Race and me to keep away, and thus, it was settled in a snap: Early dinner at Chives! Walking through their doors, I was pleasantly surprised at the dining area of this joint named for an herb with pink/purple flowers. How I love wide spaces and at Chives Cafe, they just went with two main colors, black and green that gave their place an air of seamlessness and class. The stuffed potatoes I’ve seen from their FB page took my craving hostage but it was completely set free after seeing the food list at Chives. After an extended deliberation (it seemed like it took long because I.was.famished =b), we chose their bacon mushroom pizza, pork belly, and pesto pasta. A pretty 13 inch pizza with evenly spread melted cheese topped with little pieces of bacon and button mushrooms here and there arrived at the table. White sauce pizza, we thought that was but it was better than white sauce. It was cheesy bechamel-like. My brother thought that it was the creamiest pizza he’s ever had with the slices we took home for him to taste. =) It would’ve been perfect had the dough been toasted more so it didn’t sag but, that’s no biggie. Well glossed over with BBQ glaze, tasty tender, Race remarked that they did justice to the hunk of pork belly. ^^, Also notable was the roasted chunk of sweet corn, so good that we found ourselves suddenly missing the old street food sidewalk snack: Corn roasted over embers, slathered with margarine and given a few dashes of salt. *cue sentimental music “where do I begin? While everything we’ve had so far brought us to foodie heaven, it was the stuffed potato that won my heart. It came as another side to the pork dish. I knew it was the one when I saw a photo of it on the Chives Restaurant FB page. =D It was like a potato relleno where the perfectly flavored mashed potato with bacon bits was placed back in the potato skin and topped with sour cream … or was that creme fraiche? (It wasn’t that sour.) Whatever it was, the whole enchilada – the potato, the other stuff was . Food: Straight to my favorites compilation. Yeh! Bagong paglalafangan na naman!!! Tutulog na sana akez biglang may email message. Nalowka ako food review na. Tapos na ang drama ni Xine. At Purple rain talaga ang name nung drink dyan sa Chives Bistro. Na miss ko bigla si Prince. Hello there, Mario! The Chives restaurant experience was so wonderful, it gave me the will to sit on a feature. It’s another day and I’m still thinking about the stuffed potatoes … and what to order next visit. Ang daming labada ngayon kaya late na magbeauty rest. Nadagdag ko na tong Chives Bistro Cafe sa pag eat sploran sa weekend. Yes, please to include and check Chives Bistro as soon as you can. I’m really so excited about this restaurant, I hope you also have a great time here! Camp 8? REstaurants are opening here too? Thank you for your blog, otherwise we would not have known about the restaurants like Chives opening in unlikely locations. Looking forward to trying the Chives pork belly with roasted corn. Its funny cos I was also thinking about the corn streetfood. Hi there! *hihi yes, Chives Bistro Cafe is in Camp 8. It’s just a few steps away from the Babachon Lechon store. Everything we had was really wow. I can’t wait to come back to Chives to try their other offerings. Hi, Sally! 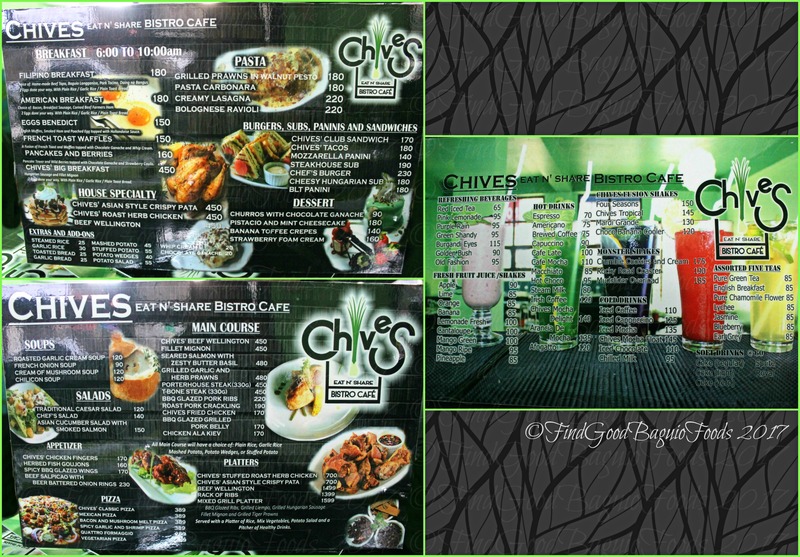 I agree, Chives Restaurant has so many things on their menu that I’m dying to try out … their drinks too. Saving for the dish you want to try; that’s the spirit! \m/ No worries, if you haven’t saved up till your Chives visit, you can always go for their more doable selections.